Used manual in good condition. 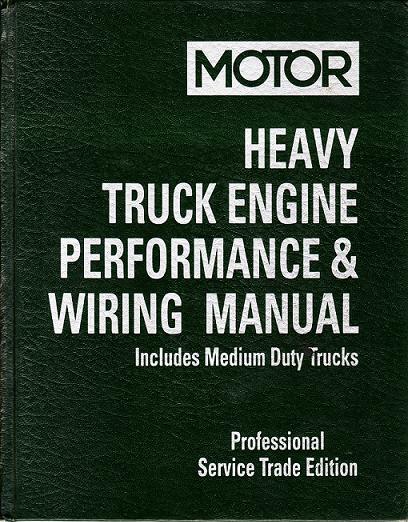 This edition of the MOTOR Medium and Heavy Truck Engine Performance & Wiring Manual covers specifications, service procedures and wiring diagrams on 1989 - 1996 Medium and Heavy Duty Truck models at time of publication. Data reported in this manual is subject to change. This publication meets or exceeds the requirements of the then current version of the California Bureau of Automotive Repair's "Minimum Requirements For Emission Repair Manuals" when used in licensed "Smog Check" stations for diagnosing and repairing emissions defects on 1989 - 1996 vehicles covered by this publication. The data reported has been compiled from authoritative sources. While every effort is made by the editors to attain accuracy, manufacturing changes as well as typographical errors and omissions may occur. The publisher then cannot be responsible nor does it assume responsibility for such omissions, errors or changes.